· Reading is relaxing and fun. · Readers effortlessly improve their vocabulary and comprehension. · Reading expands the mind by teaching about different cultures, different walks of life, different personality types, and useful information. · Reading for pleasure consistently improves test scores. · Reading on a regular basis improves writing and spelling. · Practice is the only way to become an excellent reader. Some students are too busy to read for pleasure during the school year; but this year, many of us have two or more weeks off for winter break. What a great time to become absorbed in a novel, biography, or sports book! Many of us will be traveling during the holidays. Bring books or e-readers with you and listen to recorded books as a family. Make a New Year's Resolution to prioritize reading in your family. On average, make a goal for family members to spend more time reading than watching TV. You can read electronically, articles as well as books, but you might want to limit the texting, which mostly improves your thumb flexibility and little else. One of the first things I did in my freshman year of college was to march across campus in protest of the university’s investment in South Africa. This was a time of apartheid, and Nelson Mandela had been imprisoned because he was striving for equality. In the 1980’s, many years after our own country had corrected the Jim Crow laws, South Africa still severely limited rights for blacks. They finally changed their system, resulting from divestment from countries, businesses, and universities, as well as the work of activists like Nelson Mandela. In 1990, when the South African President F.W. de Klerk finally was ready to give South African blacks the rights they deserved, he freed Nelson Mandela and taught him how to be the next leader. Both received the Nobel Peace Prize in 1993, and Nelson Mandela became President in 1994. In 1999, he resigned and handed power to younger leaders, to set an example of democracy. Nelson Mandela is a hero for so many reasons. He fought for what he knew was right, at the great risk to his life and liberty. He gave up 27 years of a quality life for the sake of his country and future generations. He did not let anyone break him. From prison, he continued his work, and when released, he became president. He could have led violent protests but instead, led a peaceful change for South Africa and advocated a country of inclusion of both the black majority and white minority. He also emphasized quality education to lift up the black population into leadership positions. He persevered while facing extremely difficult obstacles, and was an effective leader and negotiator, one to be admired throughout the world. 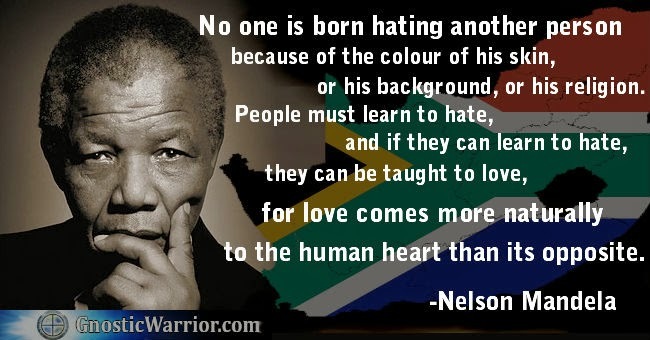 Nelson Mandela’s traits and accomplishments are a great inspiration for all of us to make the most of our own lives. Tutoring For Success on Facebook! For the past few months, Tutoring For Success has been hard at work revamping its Facebook page, and we wanted to make sure that you were in on the action! If you haven't already "liked" our page, you can do so by clicking this link: https://www.facebook.com/tutoringforsuccessinc. Tip #1: Do homework in a quiet place that is free from distractions, and focus for a solid hour with just a break or two. This takes discipline, but you will get so much more done in a shorter amount of time, with extra free time at the end! Tip #2: Use mnemonic techniques to study for those pesky quizzes and tests. For example: The order of taxonomy (Kingdom, Phylum, Class, Order, Family, Genus, Species), or "Kids Prefer Cheese Over Fried Green Spinach." Tip #3: Use a calendar to help organize and prioritize your homework time. When a long-term assignment is given, write the due date on the calendar, then space out the work to be done over the number of days that you have to do it. Be sure to factor in other homework, extracurricular activities, and free time! Using a calendar will help safeguard against procrastination and last-minute cram sessions. Tip #4: Here is a link to a list of 5 apps for smartphones that can help students keep track of their homework: http://www.nbcnews.com/id/44077249/#.UoJ5Bvmsj1o. Technology doesn't have to be a constant distraction! Tip #5: Form a study group with friends and / or classmates. Don't underestimate the power of a group, especially when it comes to working through a difficult math problem, or discussing an essay topic. Instructing a peer who doesn't fully understand the material can also help to strengthen your overall comprehension. You might even make some new friends! Tip #6: Break down material. All of us procrastinate with things we don't want to do, or that are overwhelming. For me, it was cleaning my closet and going through clothes. My husband and I used the breaking down strategy with great success. This principle can be used successfully for school projects. Use a calendar to divide the different parts of the project and spread out the tasks over many days. Any big assignment does not have to (and should not!) be done all at once. Remember: Time spent procrastinating is not really free time; it's stressful time. Tip #7 (for Thanksgiving week, but can be applied to all holiday breaks / vacations): You may not want to do homework, but Thanksgiving is a good time to: Organize notebooks, binders, and other materials; Organize your clothes, so that in December you can save morning time by easily grabbing an outfit; Work on long-term projects to save time later on. If you've enjoyed reading these study tips and would like to see more from Tutoring For Success, check us out here on Facebook and "like" our page! We will be offering motivational tools and tips all December long, so don't miss out! Give more praise. Research has shown that parents are heavy on the criticism and light on the praise. Thank and praise your children for minor daily things, and lighten up on the criticism. Appreciate your children for who they are. Be interested in what your children are doing. On a recent episode of Parenthood, the father of one boy said, "I would have loved for my son to be interested in baseball, but he was fascinated by bugs. So I got interested in bugs." Use positive incentives to get your children to do what you want. It you're accused of bribing, remind your child that a bribe is giving someone a large amount of money to do something illegal. Don't accuse. When there is an issue, state the problem without accusing, and brainstorm solutions together. Spend quality time with each child several days per week, doing something he or she likes to do. This does not need to cost money. Put your phones away during this time. Talk to your children respectfully and expect the same treatment from them. Pick your battles. If working with your own child on schoolwork is too stressful, get an outside person. Use humor whenever possible, and don't forget to have fun. If we can help you relieve stress in any way (by providing a tutor or academic coach, for example) let us know. There have been many studies showing that regular exercise improves cognition. Today’s New York Times blog, How Physical Fitness May Promote School Success by Gretchen Reynolds, describes a recent study that correlates children’s physical fitness to higher academic achievement. Ms. Reynolds’ argument, that school districts should not be slashing PE budgets, can be taken further. We as parents should make sure our children get daily exercise, not only to keep them healthy but also to boost their learning capabilities. Learning a new language is daunting, especially in a class of 30+ students. While the teachers do their best to explain the curriculum, many are wary of speaking only that language to their students, concerned that not everyone will understand. With only 50 minutes a day or one hour and 20 minutes every other day, there is not enough time for true immersion. Even for those classes that are divided into groups to practice speaking, many students have not developed the confidence to even try holding a conversation. The result is thousands of American students who take a language for years, and may even get A’s and B’s, but cannot hold a fluent conversation. Language immersion classes at many elementary schools achieve much more success with fluency, but these classes reach a minority of students. Do your child a favor by hiring a Spanish or French tutor to help practice the language. The tutor will not only help with homework, grammar, and vocabulary, but can provide practice speaking and listening, incorporating what’s being learned into real conversation, and striving for improved skills and fluency. Did you know that only 25% of people in our country graduate college? Did you know that less than 50% of students who enroll in four-year colleges graduate? Did you know that the brain, specifically the prefrontal cortex, which controls planning and impulsivity, doesn’t finish developing until age 25? There is a dramatic spurt in frontal lobe maturation between ages 17 and 20. Kids with ADHD typically have a slower developing prefrontal cortex. Some students are just not ready for college right after high school. Motivation to do the work and achieve academic excellence. There are many distractions at college. If getting your kid to get his work done in high school is like pulling teeth, how is he going to do it on his own in college? By 9th grade, kids should largely be running their own lives. By senior year of high school, students should be fairly independent. Developing independent living skills and increasing responsibility should be a big focus in high school. Ability to handle stress and effective use of at least one stress reducing routine. Exercise is most popular and effective. Yoga and meditation are other options. Ability to control impulses, such as partying, drugs and alcohol, and regulation of electronics. · Allow your child to accept responsibility for her own life, and to make her own decisions. · Parents can be consultants and help when asked. · Let kids do their own college applications and college search, with some help, as needed. · Resist being a helicopter parent – you are not doing your kid a service in the long run. · If your child is ready for college but will be more successful with support, consider hiring tutors or an academic or life coach to help. Check out college support systems while researching colleges. · Sometimes a student can be successful just by lightening the course load. This can be achieved by taking summer courses or taking more than 4 years to graduate. · Some more difficult courses can be taken at a community college in the summer, with the support of a tutor. · Support is crucial. Either get the help of a good school counselor or hire a coach. If your child has the motivation to go to college right after high school, becoming independent should be a major high school goal. If the motivation isn’t there yet, your child may be a late bloomer and may be more successful by attending college a little later. As you know, college is expensive. Use your money wisely. Is your high school or middle school student already talking about college? Is your child looking forward to becoming independent? College is an important time in a teenager’s life; it can be exciting, but also overwhelming, especially if your child is unprepared to deal with the stress that often comes with newfound freedom. Too many college students fall victim to eating disorders, irregular sleep patterns, and mental health issues simply because they did not establish a routine of healthy habits while living at home. These habits don’t need to start once that acceptance letter arrives in the mail, either – In fact, the earlier a healthy routine is established for your child, the easier it will be to continue it once they are on their own. So just because college (or even high school) is a thing of the distant future for your family, maintaining overall good health should be practiced by everyone, every day, starting right now. · Encourage good hygiene from an early age: Emphasize the importance of regular showering/bathing, teeth brushing, face and hand washing, etc. · Emphasize the importance of a good night’s sleep: College students are at high risk for not getting the appropriate amount of sleep, what with erratic class schedules, intense course loads, and busy social lives. While it might be difficult to adjust to their new routine and therefore some loss of sleep could be inevitable, if your children have learned from personal experience the importance of a good night’s sleep, chances are they will strive to make it a top priority. · Encourage healthy eating habits: We’ve all heard of the dreaded “Freshman 15;” some college freshmen think that’s it unavoidable and simply give in to the idea with little or no resistance. Late-night snacking, stress, irregular sleep schedules, and unhealthy meal choices can all lead to weight gain in college, if not before. Prevent these patterns by setting an example for healthy eating at home long before you even start those college visits. Even simple things such as having healthy snacks around the house and promoting 3 meals a day can pave the way for good, long-term habits. · Establish an exercise routine, or encourage your child’s interest in being active: Exercise can do amazing things for your body, not to mention your mental health. Many students enjoy sports and are involved in these activities after school or through the community. Dance, yoga, cycling, and hiking are also great ways to keep your child on the move. If organized sports aren’t her thing, try working out together as a family; even something as simple as jumping rope or taking the dog for a long walk can help to foster a positive view of staying active. · Devote time to organization and stress management: Succumbing to the pressures of homework overload is all too common amongst students of all ages these days. When a child isn’t doing well in school, sometimes the culprit is simply disorganization. Do you keep a planner, or mark things to remember on the calendar? Have your child do the same with school assignments and test dates. Devote a specific time of day to homework, and have your child pack up his or her bag the night before, making sure everything needed for the next day is ready to go. An academic coach can also assist with organization, as well as motivation. Healthy habits will not only improve students’ overall well being, but also their academic performance. When preparing for college, make sure you focus as much on your child’s physical, mental, and emotional health as you do on applications and AP courses. Remember: It’s never too early to start promoting a positive routine for your whole family! Before we had children, Valentine’s Day was all about romance. But once we had two little girls, it became all about them, and family love overtook romantic love on this special day. Now we give gifts and do special family activities to celebrate our family and our love for each other. · Listen to your child. When she is telling you something, stop what you are doing, look at her in the eye, and really listen. When you respond, do not give advice unless you are asked. Just validate what he has to say. · Spend alone time with each of your children daily, or weekly, or whatever you can manage. This can be going to Starbucks, cooking together, doing yard work, or driving in the car – anything that helps you bond and communicate. · Have fun with your children. Play a game together, watch a movie together, and laugh together. · When they misbehave, remember that this is not a personal affront to you – they are just being kids. This Valentine’s Day, celebrate your family – cut out some time for the whole group to have fun together. When talking about motivation in school, I like to start with reading for pleasure. Since schoolwork involves so much reading and writing, reading for pleasure is the biggest predictor of success at school. · Does your child hate to read? If you’ve ever read a good book, you know that getting into another world can be relaxing and fun. If your child hates to read, it’s because he sees it not as fun, but as work. Talk to the teacher and try to find out if he is on grade level or below. If below, you will need to get extra support to help him catch up. Meanwhile, help him pick out attractive books that he can read easily. If they are at the right reading level, he will be more motivated to read them. Reading for pleasure is the best way to improve reading, writing, spelling, and grammar. · Help your child find books that he likes. He can find out from his friends what they are reading and try different things. If he doesn’t like fiction, try nonfiction. The library has books for every area of interest. Next, I like to see if the work is too hard or too overwhelming. The best way to figure this out is to sit down with your child and go through every assignment to see how easy or hard it is, and how much time it takes. · If the work is too hard, find out why. Ask your child to try and narrow down the obstacles. Sometimes just getting extra help will improve motivation. · If there is too much work, try breaking it down, especially long term assignments; you can also talk to the teacher about reducing the load. Particularly with math, some children take longer to do the problems than others, and they may learn just as much with fewer problems. · In middle school and high school, a course load with too many honors and AP classes can overwhelm a student. When registering for next year’s classes, consider scaling back if appropriate. Finally, some students need more structure. Is homework time a set time during the day? If your student has too much time on her hands, she may be prone to procrastination, especially if a parent isn’t home to help as needed. · Try to have homework time scheduled for one 2-3 hour block or two 1-1.5 hour blocks each day for high school, and less for lower grades. Some of that time should be when a parent is available. · Help your child plan a schedule, arrange for breaks in between subjects, and put the homework in a folder and in her backpack right away to make sure it gets handed in. · Reward your child for doing a good job. Remember, success leads to motivation. If you can work with your child’s teachers to set her up for success, she will work harder. If you think of the things she enjoys doing, they are probably things she is good at. With the right support, your child can become successful at school.